Well, I think I should let everyone know upfront that I am a huge sucker for alien movies. They can be horribly made but afterwards I’ll still have trouble walking around the house in the dark. When I watched SIGNS for the first time, I was terrified and held my dad’s hand throughout the whole thing. Granted I was only about 13 when I watched that one. 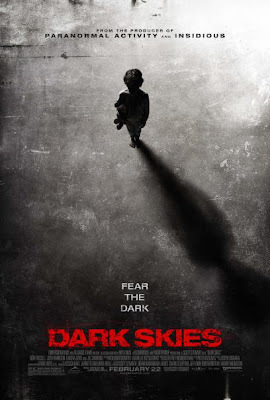 Nonetheless, I was pretty excited when I first saw the trailer for DARK SKIES. Unfortunately, the trailer doesn’t leave much to the imagination and pretty much lays out the entire plot of the film. The “Grays,” a type of alien, are watching – “studying” the Barrett family. Before one of the sons is abducted, the family must prepare to defend themselves. During the climax, there is an homage (direct rip off?) to SIGNS. The family boards up all their windows, sit together and share a final meal in which they reminisce. It would have been a nice touch if it hadn’t been so blatantly pulled from SIGNS. Though, what else could really be done in this situation? The film actually had solid character development; something that horror movies tend to pass over for cheap thrills and scares. After the film, I heard one audience member ask another if she had been crying. She had been. That’s how badly you wanted this family to pull through and there were several heart tugging moments. Oh, I also thought some of the cinematography was above average and I loved the overall “gray” hue of the film. There were a number of clichés but I didn’t expect anything more. Overall, not a complete waste of time and a rather entertaining alien flick. 2 out of 4 stars.